The Edmund Velasco Quintet and Quartet are premiere jazz ensembles that specializes in original jazz works. The members of the ensemble have worked with some of the great jazz musicians. Some of these include Poncho Sanchez, Mel Torme, Jack Sheldon, Ramon Banda, Lionel Hampton, Woody Herman, and many others. 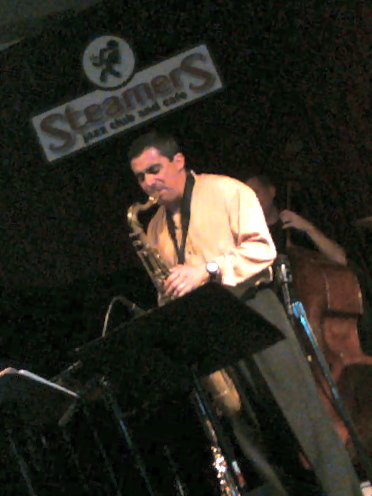 The individuals have recorded with The Clayton Hamilton Big Band, The Estrada Brothers, The group specializes in presenting new jazz works written by one of the members of the ensemble. Over the 20 years they have been together, they have composed over 200 new works and they have released four CDs (Alligator Rhythm, The Blues in Me, Smoke Rises and most recently, Sign of Our Times) dedicated to sharing the exciting new compositions. EVQ has toured the East Coast and Europe showcasing their new works as well as being feature in jazz clubs around the country such as Steamers Jazz Cafe in Fullerton, The Baked Potato in Hollywood, Baker’s Keyboard Lounge in Detroit, andThe Cutting Room in New York. They are not only accomplished composers and jazz musicians but can also play many varieties of music including rock, funk, and pop. Please visit us at edmundvelasco.com for more information.